Placing a check mark in the Sub column would indicate that the current Set is a Subset. Selecting a row under the Measures column would allow you to input which measures the set is referencing. Note columns are there for any quick instructions or notes the ensemble (or you) might need. These notes can be quickly imported into a Text Box and displayed on the field through the Text Box Tool. To pull the Production Sheet away so you may view the field and the Production Sheet at the same time, press the “Detach” button in the upper right corner of the Production Sheet window. You will now be able to drag the Production Sheet anywhere on your screen. To pin the window back to 3D, press the “Pin” button. Go to File > Application Options > Display (tab) and choose "Reset Window Locations" at the bottom of the window. 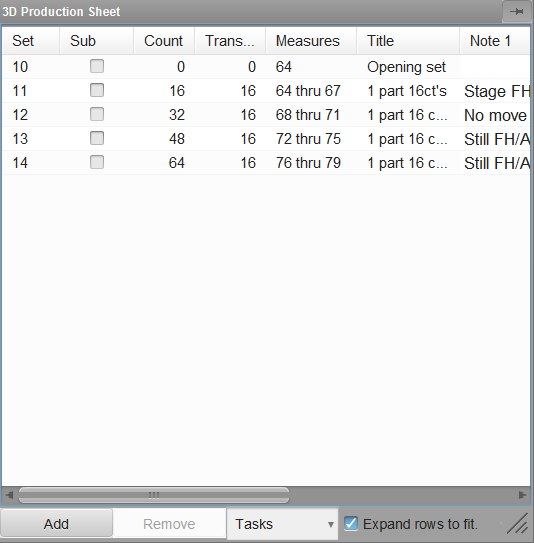 The production sheet is not showing even though we have selected it numerous times.